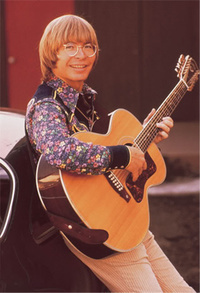 Henry John Deutschendorf, Jr. (December 31, 1943 " October 12, 1997), known professionally as John Denver, was an American singer, songwriter, activist, and humanitarian. He was one of the most popular acoustic artists of the 1970s. After traveling and living in numerous locations while growing up in his military family, Denver began his music career in folk music groups in the late 1960s. His greatest commercial success was as a solo singer, starting in the 1970s. Throughout his life, Denver recorded and released approximately 300 songs, about 200 of which he composed. He performed primarily with an acoustic guitar and sang about his joy in nature, his enthusiasm for music, and his relationship trials. Denver's music appeared on a variety of charts, including country and western, the Billboard Hot 100, and adult contemporary, in all earning him twelve gold and four platinum albums with his signature songs "Take Me Home, Country Roads", "Annie's Song", "Rocky Mountain High", and "Sunshine on My Shoulders". Denver further starred in films and several notable television specials in the 1970s and 1980s. In the following decades, he continued to record, but also focused on calling attention to environmental issues, lent his vocal support to space exploration, and testified in front of Congress to protest against censorship in music. He was known for his love of the state of Colorado, which he sang about numerous times. He lived in Aspen, Colorado, for much of his life, and influenced the governor to name him Poet Laureate of the state in 1974. The Colorado state legislature also adopted "Rocky Mountain High" as one of its state songs in 2007. Denver was an avid pilot, and died in his personal aircraft at the age of 53. • 'Dancing with the Stars' Spoilers: "Country Night" dances, songs and musical guests including Lauren Alaina! This webpage uses material from the Wikipedia article "John_Denver" and is licensed under the GNU Free Documentation License. Reality TV World is not responsible for any errors or omissions the Wikipedia article may contain.